Bird's eye chili, bird eye chili, bird's chili, piri piri or Thai chili is a chili pepper, a variety from the species Capsicum annuum, commonly found in Ethiopia and across Southeast Asia. It is often confused with a similar-looking chili derived from the species Capsicum frutescens, the cultivar "siling labuyo". Capsicum frutescens fruits are generally smaller and characteristically point to the sky. It is used extensively in Thai, Malaysian, Singaporean, Lao, Khmer, Indonesian, and Vietnamese cuisines. The bird's eye chili is small, but is quite hot (piquant). It measures around 50,000 - 100,000 Scoville units, which is at the lower half of the range for the hotter habanero but still many times more spicy than a jalapeño. All chilis found around the world today have their origins in Mexico, Central America, and South America. They were spread by Spanish and Portuguese colonists, missionaries, and traders, together with many other now common crops such as maize, tomatoes and pineapples. This is now called the Columbian Exchange. The chili varieties found in Southeast Asia today were brought there in the 16th or 17th century. African bird's eye chilis, particularly those grown in Kenya, are some of the most pungent chiles in the world. The African variant's strength can be compared with habaneros or scotch bonnets on the Scoville scale. In Thai cuisine, these chilis are highly valued for their fruity taste and extreme spiciness. 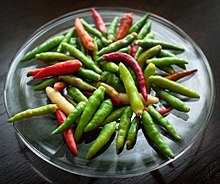 They are extensively used in many Thai dishes, such as in Thai curries and in Thai salads, green as well as the ripe red chilis; or they can just be eaten raw on the side, with for instance, khao kha mu (stewed pork trotter served with rice). The more decorative, but slightly less pungent chili, sometimes known as "Thai ornamental", has peppers that point upward on the plant, and range from green to yellow, orange, and then red. It is the basis for the hybrid cultivar "Numex twilight", essentially the same, but less pungent, and starting with purple fruit, creating a rainbow effect. These peppers can grow wild in places such as Saipan and Guam. Wikimedia Commons has media related to Bird's eye chili. ^ DeWitt, D.; Bosland, P.W. (2009). The Complete Chile Pepper Book: A Gardener's Guide to Choosing, Growing, Preserving, and Cooking. Timber Press. ISBN 978-0-88192-920-1. ^ "The world's 10 hottest chillies". Australia Geographic. 2011-09-13. ^ "Easy to Grow Chili – Birds Eye Chilis". growingchillies.net. ^ Andrews, Jean (1995). "Historical Background". Peppers: the Domesticated Capsicums. Austin, Texas, USA: University of Texas Press. pp. 1–10. ^ "How the chili spread from its South American home and spiced up world cuisine – TIME's Summer Journey – TIME". TIME.com. 14 June 2007. ^ Joe Cummings (2000). Thailand. Lonely Planet. pp. 79–. ISBN 978-1-86450-026-4. ^ "Nam Pla Prik น้ำปลาพริก - The Ubiquitous Thai Table Sauce". SheSimmers. 2010-02-16.